This vessel used to be the famous Greenwich Bookboat that sailed into Greenwich in the summer of 1978, it was a favorite destination for children for the next 20-odd years before being purchased by the current owners who have owned her for the past 25 years. There are roof lights throughout giving plenty of natural light, as well as small portholes which add great character. Access is via a side door into the wheelhouse where you have a large L-shape galley. The wide staircase takes you down to the saloon area which includes large Wood burning stove, a small door off the saloon leads to the second bedroom where the owners have made use of every inch of the space! Moving forward from the saloon you have the master bedroom which benefits from a bath & sink in a open plan style on the port side. Continue forward into heads which benefits from a large shower. 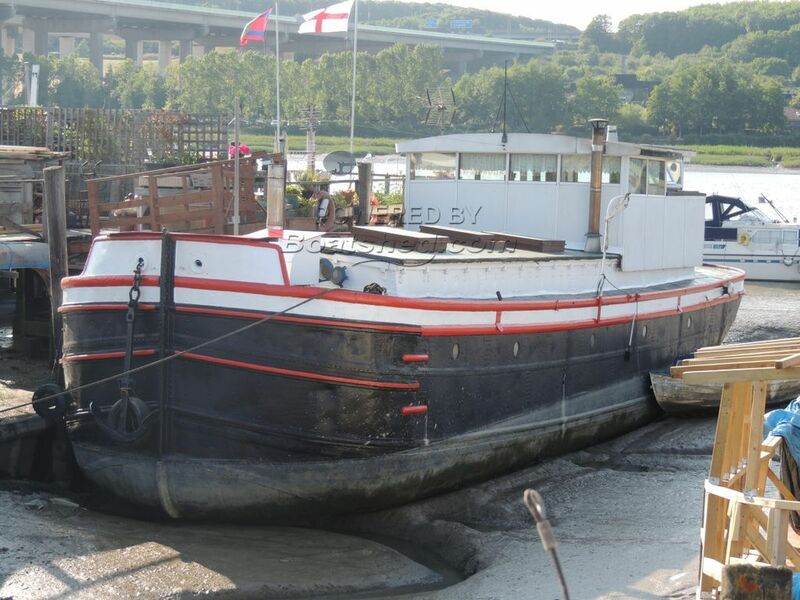 Boatshed Medway are delighted to present this Humber Keel Barge which use to be the famous Greenwich Bookboat. The Bookboat sailed into Greenwich in the summer of 1978, She then become a favorite destination for children for the next 20-odd years. The Bookboat was the only specialist children’s bookshop south of the river and probably the only floating children’s bookshop in the world. And for its size it packed quite a punch - by 1984 it was carrying over 7,000 titles! She sadly had to close in the early 90's due to Health & safety laws & a few years later she was purchased by the current owners who converted her into the 2 bed live aboard she is today. This lovely vessel is stacked in history & makes a very good sized 2 bedroom home on the water. The residential mooring she currently occupies can be taken over subject to the marina's approval, the current owners are paying around £300 per month & she located close to the historic town of Rochester in Kent. This Humber Barge 60ft has been personally photographed and viewed by Jamie Nash of Boatshed Medway. Click here for contact details. Please note this comments section is public. Please do not post your personal details here. To enquire about purchasing this boat, please contact the broker directly at boats@boatshedmedway.com. Please read our commenting guidelines before posting.